Hey everyone! This is the 2nd year for the week-long feature Stand Up Against Abuse. This year I was asked by my best blogging friend Jessica from Confessions of a Bookaholic to be her co-host! 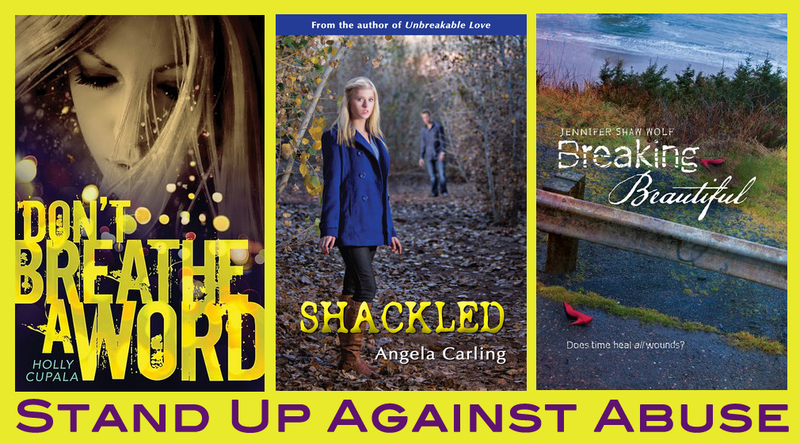 We will be posting interviews with 3 fabulous young adult authors and featuring their books. Each book has a theme related to relationship abuse. As Jessica mentioned last year, young adult books have the ability to alter the life of the person who reads them. Teens or adults can see similarities in a book that can allow them to maybe notice that their own relationship isn't healthy. They may finally get the courage to break free from violence. These books show warning signs, consequences, and the ultimate downfall that can occur do to relationship abuse. It may also provide the guidance a friend may need in order to seek help for someone else. All this week we hope to highlight these things and inspire people to pick up these books, and others, that carry a strong message. We would really appreciate it if you could help spread the word in any way possible. Post the button on your sidebar, write a blog post with the resources and links, tweet about these books, tell a friend -- anything at all. One small act may encourage someone to take action. Young adult books can save lives! Authors Holly Cupala, Angela Carling, and Jennifer Shaw Wolf will be here answering some questions and they have offered up copies of their newest books. In order to spread the word about this topic, we will only be offering extra entries for links on twitter and/or blogs that link to this page. I will update this page throughout the week and link the author interviews. In addition, this page will contain the important resources that individuals can use in case they are in an abusive relationship. Please help spread the word about this topic and share the links on this page. You can grab the button below by copying the code. It will link to this page. 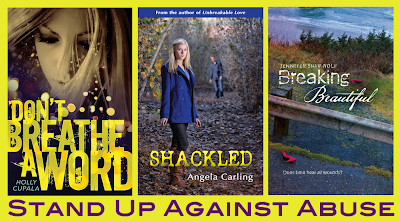 1 winner will win SIGNED copies of Don't Breathe a Word, Shackled, and Breaking Beautiful. You must be at least 13 (or have permission) to enter. Name and email must be provided. Contest is US only and ends August 6th. NOTE: This is the same form you will find on Jessica's blog (Confessions of A Bookaholic) as well. Please only fill it out once! First off, I have to say a HUGE thank you to Jessica from Confessions of a Bookaholic for asking me to co-host the amazing event she's put together to. If only one person is helped or is able to help someone else or even helped to feel not alone by these authors and their books, by these posts then in my eyes I'd view it a huge success. Thank you to our three authors - Holly Cupala, Angela Carling, Jennifer Shaw Wolf for writing these books and for taking the time to be part of an event and subject matter that needs a loud voice. It's because of you that it helps to get it. Another thank you goes out to the authors and publishers for donating the copies of these titles provided in the giveaway. And last but not least, Thank you goes out to our readers. Good luck to each of you who enters. If you have any questions please feel free to email. I think this is so great! I wont enter the giveaway because I am no longer young adult, though most of the boooks I read are, and I would rather someone win that IS still young and can benefit from these books! Such a great idea. I'm not entering the contest, but I'll put the button up when I get home.